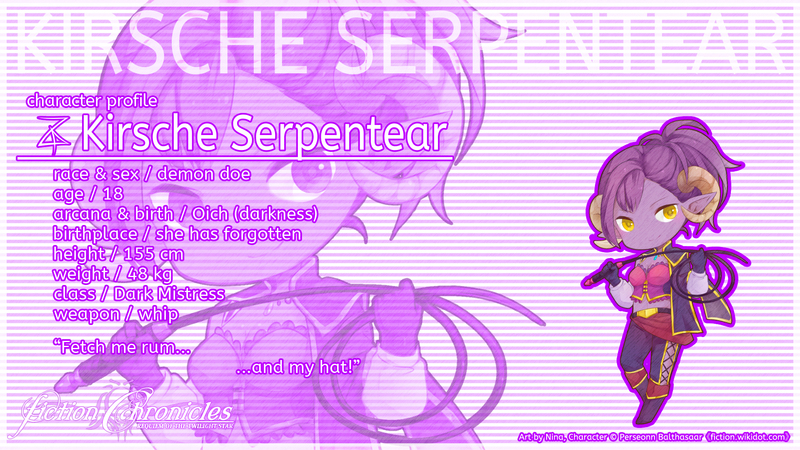 Kirsche Serpentear is a demon Chatelaine Warden who has forgotten her past. On a gloomy day, Kirsche lost her ship, Henrietta, along with her entire crew. She was found on a beach by Renn and Perseonn. After being nursed back to health, Kirsche tags along, hoping to find her ship. Due to how Renn dresses, she considers him gay. Kirsche has gold eyes and dark orchid hair with a side ponytail. She wields a whip and is not reluctant to use it on her friends, which is one reason Sauron and Perseonn obey her commands. Although she likes to command her male party members by the crack of her whip, deep down she actually cares about them. However, she is not the type of person to explicitly say that she cares for others. Kirsche treasures her ship and her small pirate hat. In battle, Kirsche wields a whip and acts as the main spellcaster and debuffer of the party. Kirsche cannot cook at all, but she is not ashamed of it. She was once persuaded to make a dish and the party claimed it to be pure poison. When idling in a town, she will use her beautiful voice to sing in pub or bars to collect money. Sometimes she does it along with Sleipial. Kirsche's journey represents her ability to regenerate. She can only allow birth to new experience and new ways of being by letting go of that which is no longer necessary in her life. Kirsche's name was derived from the Kirschwasser in Xenosaga. Her last name was chosen by one of my cousin. She is 18 years old during the event of Requiem of the Twilight Star, 155 cm tall and weighs 48 kg. This is Kirsche's later pirate concept, which is actually a backwards creation from her SC4 version. Originally one of Spica's unused costumes. Since it looks good for sailing seas, I decided to recolor it and give it to Kirsche, with addition of the hat. Kirsche is further developed from Arcadia. This costume is the main pirate Kirsche, the outfit she uses when she travels the sea. The hat might feel weird, but I want her to have at least one costume with it. This outfit expands her SC3 pirate look. Since the White color of the pants cannot be recolored, I have to improvise. Her color scheme is #249, Marguerite and Pansy. I never thought to use this outfit for Kirsche. It fits her well, but apparently the skin part of the outfit stayed at default, forcing me to put her in her previous skin color. 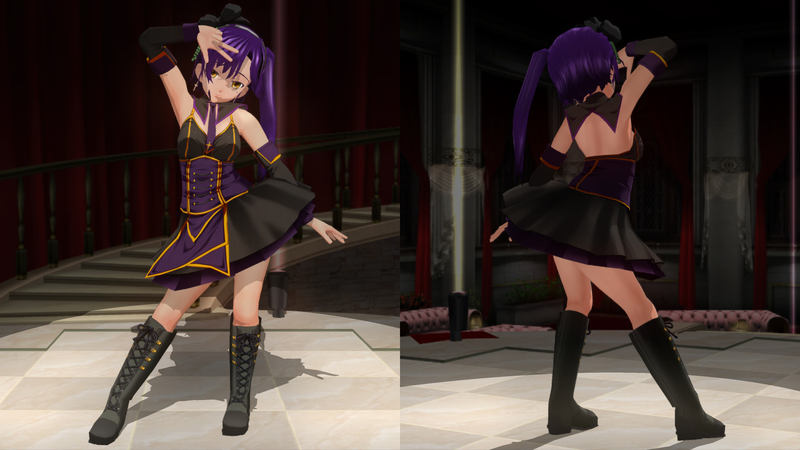 This costume is a color edit version of her previous costume (Costume 5) with minor alteration since Kirsche's race was changed to demon instead of (dark) elf. Most notable her eye is now closer to amber instead of closer to chartreuse. Her outfit color is changed to contrast with Perseonn. Getting the correct skin shade is impossible in SC5, but the MusuMake rendition pretty much got her correct skin tone. Kirsche's transcendence form, turning her overall color to pale white. The form is a great bone serpent with her attached to the mouth of the serpent (similar to a ship's figurehead). A casual outfit showing how a demon doe looks like, although still missing horns. This is also the outfit she wears during the event of Secret Promise. A barmaid outfit she wear during her ending. She had given up her pirate life and live peacefully with one she made promise with. The outfit is the original elf Kirsche version, with a gothic look and the little hat she so adores. Her hat position is reversed of what Blanche has, so if you put them together, they look cute. Kirsche in her pirate outfit, which is the accurate fiction Chronicles vision. The flower petals does not really fit her, but that's ignorable. The Chic Swordswoman, a.k.a. Xi Swordsman outfit has been my first choice for her. Glad that KOEI made the outfit available. A callback to her DW7 costume, but redesigned to be her later costume. Tested with Hanzō's sickle and Kai's whip sword, I liked the whip sword more.